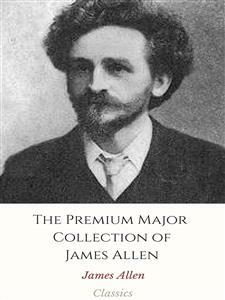 James Allen (November 28, 1864–1912) was a British philosophical writer known for his inspirational books and poetry and as a pioneer of the self-help movement. His best known work, As a Man Thinketh, has been mass produced since its publication in 1903. It has been a source of inspiration to motivational and self-help authors. Born in Leicester, England, into a working class family, Allen was the eldest of two brothers. His mother could neither read nor write while his father, William, was a factory knitter. In 1879, following a downturn in the textile trade of central England, Allen's father traveled alone to America to find work and establish a new home for the family. Within two days of arriving his father was pronounced dead at New York City Hospital, believed to be a case of robbery and murder. At age fifteen, with the family now facing economic disaster, Allen was forced to leave school and find work. For much of the 1890s, Allen worked as a private secretary and stationer in several British manufacturing firms. In 1893, Allen moved to London where he met Lily Louisa Oram who he then wed in 1895. In 1898, Allen found an occupation in which he could showcase his spiritual and social interests as a writer for the magazine The Herald of the Golden Age. At this time, Allen entered a creative period where he then published his first book of many books, From Poverty to Power (1901). In 1902, Allen began to publish his own spiritual magazine, The Light of Reason, later retitled The Epoch. In seeking for pleasures here and rewards hereafter men have destroyed (in their hearts) the Temple of Righteousness, and have wandered from the Kingdom of Heaven. By ceasing to seek for earthly pleasures and heavenly rewards, the Temple of Righteousness is restored and the Kingdom of Heaven is found. This truth is for those who are ready to receive it; and this book also is for those whose souls have been prepared for the acceptance of its teaching. I sojourned with philosophy, but my heart was sore with vanity. And I cried, Where is Peace to be found! And where is the hiding place of truth! EVERY HUMAN SOUL IS IN NEED. The expression of that need varies with individuals, but there is not one soul that does not feel it in some degree. It is a spiritual and casual need which takes the form, in souls of a particular development, of a deep and inexpressible hunger which the outward things of life, however abundantly they may be possessed, can never satisfy. Yet the majority, imperfect in knowledge and misled by appearances, seek to satisfy this hunger by striving for material possessions, believing that these will satisfy their need, and bring them peace. Every soul, consciously or unconsciously, hungers for righteousness, and every soul seeks to gratify that hunger in its own particular way, and in accordance with its own particular state of knowledge. The hunger is one, and the righteousness is one, but the pathways by which righteousness is sought are many. They who seek consciously are blessed, and shall shortly find that final and permanent satisfaction of soul which righteousness alone can give, for they have come into a knowledge of the true path. They who seek unconsciously, although for a time they may bathe in a sea of pleasure, are not blessed, for they are carving out for themselves pathways of suffering over which they must walk with torn and wounded feet, and their hunger will increase, and the soul will cry out for its lost heritage—the eternal heritage of righteousness. Not in any of the three worlds (waking, dream and sleep) can the soul find lasting satisfaction, apart from the realization of righteousness. Bodied or disembodied, it is ceaselessly driven on by the discipline of suffering, until at last, in its extremity, it flies to its only refuge—the refuge of righteousness—and finds that joy, satisfaction, and peace which it had so long and so vainly sought. The great need of the soul, then, is the need of this permanent principle, called righteousness, on which it may stand securely and restfully amid the tempest of earthly existence, no more bewildered, and whereon it may build the mansion of a beautiful, peaceful, and perfect life. It is the realization of this principle where the Kingdom of Heaven, the abiding home of the soul, resides, and which is the source and storehouse of every permanent blessing. Finding it, all is found; not finding it, all is lost. It is an attitude of mind, a state of consciousness, an ineffable knowledge, in which the struggle for existence ceases, and the soul finds itself at rest in the midst of plenty, where its great need, yea, its every need, is satisfied, without strife and without fear. Blessed are they who earnestly and intelligently seek, for it is impossible that such should seek in vain. I am in truth, and Truth abides in me. IT HAS BEEN SAID that the laws of Nature are cruel; it has likewise been said that they are kind. The one statement is the result of dwelling exclusively upon the fiercely competitive aspect of Nature; the other results from viewing only the protective and kindly aspect. In reality, natural laws are neither cruel or kind; they are absolutely just—are, in fact, the outworking of the indestructible principle of justice itself. The cruelty, and consequent suffering, which is so prevalent in Nature, is not inherent in the heart and substance of life; it is a passing phase of evolution, a painful experience, which will ultimately ripen into the fruit of a more perfect knowledge; a dark night of ignorance and unrest, leading to a glorious morning of joy and peace. When a helpless child is burnt to death, we do not ascribe cruelty to the working of the natural law by virtue of which the child was consumed; we infer ignorance in the child, or carelessness on the part of its guardians. Even so, men and creatures are daily being consumed in the invisible flames of passion, succumbing to the ceaseless interplay of those fiery psychic forces which, in their ignorance, they do not understand, but which they shall at last learn how to control and use to their own protection, and not, as at present, foolishly employ them to their own destruction. To understand, control and harmoniously adjust the invisible forces of its own soul is the ultimate destiny of every being and creature. Some men and women, in the past, have accomplished this supreme and exalted purpose; some, in the present, have likewise succeeded, and, until this is done, that place of rest wherein one receives all that is necessary for one's well-being and happiness, without striving, and with freedom from pain, cannot be entered. In an age like the present, when, in all civilized countries, the string of life is strained to its highest pitch, when men and women, striving each with each in every department of life for the vanities and material possessions of this perishable existence, have developed competition to the utmost limit of endurance—in such an age the sublimest heights of knowledge are scaled, the supremest spiritual conquests are achieved; for when the soul is most tired, its need is greatest, and where the need is great, great will be the effort. Where, also, the temptations are powerful, the greater and more enduring will be the victory. Men love the competitive strife with their fellows, while it promises, and seems to bring them gain and happiness; but when the inevitable reaction comes, and the cold steel of selfish strife which their own hands have forged enters their own hearts, then, and not till then, do they seek a better way. "Blessed are they that mourn,"—that have come to the end of strife, and have found the pain and sorrow to which it leads; for unto them, and unto them only, can open the door which leads to the Kingdom of Peace. In searching for this Kingdom, it is necessary to fully understand the nature of that which prevents its realization—namely, the strife of nature, the competitive laws operative in human affairs, and the universal unrest, insecurity and fear which accompany these factors; for without such an understanding there can be no sound comprehension as to what constitutes the true and false in life, and therefore no real spiritual advancement. Before the true can be apprehended and enjoyed, the false must be unveiled; before the real can be perceived as the real, the illusions which distort it must be dispersed; and before the limitless expanse of Truth can open before us, the limited experience which is confined to the world of visible and superficial effects must be transcended. Let, therefore, those of my readers who are thoughtful and earnest, and who are diligently seeking, or are willing to seek, for that basis of thought and conduct which shall simplify and harmonize the bewildering complexities and inequalities of life, walk with me step by step as I open up the way to the Kingdom; first descending into Hell (the world of strife and self-seeking) in order that, having comprehended its intricate ways, we may afterwards ascend into Heaven (the world of Peace and Love). It is the custom in my household, during the hard frosts of winter, to put out food for the birds, and it is a noticeable fact that these creatures, when they are really starving, live together most amicably, huddling together to keep each other warm, and refraining from all strife; and if a small quantity of food be given them they will eat it with comparative freedom from contention; but let a quantity of food which is more than sufficient for all be thrown to them, and fighting over the coveted supply at once ensues. Occasionally we would put out a whole loaf of bread, and then the contention of the birds became fierce and prolonged, although there was more than they could possibly eat during several days. Some, having gorged themselves until they could eat no more, would stand upon the loaf and hover round it, pecking fiercely at all newcomers, and endeavouring to prevent them from obtaining any of the food. And along with this fierce contention there was noticeably a great fear. With each mouthful of food taken, the birds would look around in nervous terror, apprehensive of losing their food or their lives. In this simple incident we have an illustration—crude, perhaps, but true—of the basis and outworking of the competitive laws in Nature and in human affairs. It is not scarcity that produces competition, it is abundance; so that the richer and more luxurious a nation becomes, the keener and fiercer becomes the competition for securing the necessaries and luxuries of life. Let famine overtake a nation, and at once compassion and sympathy take the place of competitive strife; and, in the blessedness of giving and receiving, men enjoy a foretaste of that heavenly bliss which the spiritually wise have found, and which all shall ultimately reach. The fact that abundance, and not scarcity, creates competition, should be held constantly in mind by the reader during the perusal of this book, as it throws a searching light not only on the statements herein contained, but upon every problem relating to social life and human conduct. Moreover, if it be deeply and earnestly meditated upon, and its lessons applied to individual conduct, it will make plain the Way which leads to the Kingdom. Let us now search out the cause of this fact, in order that the evils connected with it may be transcended. Every phenomenon in social and national life (as in Nature) is an effect, and all these effects are embodied by a cause which is not remote and detached, but which is the immediate soul and life of the effect itself. As the seed is contained in the flower, and the flower in the seed, so the relation of cause and effect is intimate and inseparable. An effect also is vivified and propagated, not by any life inherent in itself, but by the life and impulse existing in the cause. Looking out upon the world, we behold it as an arena of strife in which individuals, communities, and nations are constantly engaged in struggle, striving with each other for superiority, and for the largest share of worldly possessions. We see, also, that the weaker fall out defeated, and that the strong — those who are equipped to pursue the combat with undiminished ardour — obtain the victory, and enter into possession. And along with this struggle we see the suffering which is inevitably connected with it — men and women, broken down with the weight of their responsibilities, failing in their efforts and losing all; families and communities broken up, and nations subdued and subordinated. We see seas of tears, telling of unspeakable anguish and grief; we see painful partings and early and unnatural deaths; and we know that this life of strife, when stripped of its surface appearances, is largely a life of sorrow. h that aspect of human life with which we are now dealing; such are the effects as we see them; and they have one common cause which is found in the human heart itself. As all the multiform varieties of plant life have one common soil from which to draw their sustenance, and by virtue of which they live and thrive, so all the varied activities of human life are rooted in, and draw their vitality from, one common source—the human heart. The cause of all suffering and of all happiness resides, not in the outer activities of human life, but in the inner activities of the heart and mind; and every external agency is sustained by the life which it derives from human conduct. The organized life-principle in man carves for itself outward channels along which it can pour its pent-up energies, makes for itself vehicles through which it can manifest its potency and reap its experience, and, as a result, we have our religious, social and political organizations. All the visible manifestations of human life, then, are effects; and as such, although they may possess a reflex action, they can never be causes, but must remain forever what they are—dead effects, galvanized into life by an enduring and profound cause. It is the custom of men to wander about in this world of effects, and to mistake its illusions for realities, eternally transposing and readjusting these effects in order to arrive at a solution of human problems, instead of reaching down to the underlying cause which is at once the centre of unification and the basis upon which to build a peace-giving solution of human life. The strife of the world in all its forms, whether it be war, social or political quarrelling, sectarian hatred, private disputes or commercial competition, has its origin in one common cause, namely, individual selfishness. And I employ this term selfishness in a far-reaching sense; in it I include all forms of self-love and egotism— I mean by it the desire to pander to, and preserve at all costs, the personality. This element of selfishness is the life and soul of competition, and of the competitive laws. Apart from it they have no existence. But in the life of every individual in whose heart selfishness in any form is harboured, these laws are brought into play, and the individual is subject to them. Innumerable economic systems have failed, and must fail, to exterminate the strife of the world. They are the outcome of the delusion that outward systems of government are the causes of that strife, whereas they are but the visible and transient effect of the inward strife, the channels through which it must necessarily manifest itself. To destroy the channel is, and must ever be ineffectual, as the inward energy will immediately make for itself another, and still another and another. Strife cannot cease; and the competitive laws must prevail so long as selfishness is fostered in the heart. All reforms fail where this element is ignored or unaccounted for; all reforms will succeed where it is recognized, and steps are taken for its removal. Selfishness, then, is the root cause of competition, the foundation on which all competitive systems rest, and the sustaining source of the competitive laws. It will thus be seen that all competitive systems, all the visible activities of the struggle of man with man, are as the leaves and branches of a tree which overspreads the whole earth, the root of that tree being individual selfishness, and the ripened fruits of which are pain and sorrow. This tree cannot be destroyed by merely lopping off its branches; to do this effectively, the root must be destroyed. To introduce measures in the form of changed external conditions is merely lopping off the branches; and as the cutting away of certain branches of a tree gives added vigour to those which remain, even so the very means which are taken to curtail the competitive strife, when those means deal entirely with its outward effects, will but add strength and vigour to the tree whose roots are all the time being fostered and encouraged in the human heart. The most that even legislation can do is to prune the branches, and so prevent the tree from altogether running wild. Great efforts are now being put forward to found a "Garden City," which shall be a veritable Eden planted in the midst of orchards, and whose inhabitants shall live in comfort and comparative repose. And beautiful and laudable are all such efforts when they are prompted by unselfish love. But such a city cannot exist, or cannot long remain the Eden which it aims to be in its outward form, unless the majority of its inhabitants have subdued and conquered the inward selfishness. Even one form of selfishness, namely, self-indulgence, if fostered by its inhabitants, will completely undermine that city, levelling its orchards to the ground, converting many of its beautiful dwellings into competitive marts, and obnoxious centres for the personal gratification of appetite, and some of its buildings into institutions for the maintenance of order; and upon its public spaces will rise jails, asylums, and orphanages, for where the spirit of self-indulgence is, the means for its gratification will be immediately adopted, without considering the good of others or of the community (for selfishness is always blind), and the fruits of that gratification will be rapidly reaped. The building of pleasant houses and the planting of beautiful gardens can never, of itself, constitute a Garden City unless its inhabitants have learned that self-sacrifice is better than self-protection, and have first established in their own hearts the Garden City of unselfish love. And when a sufficient number of men and women have done this, the Garden City will appear, and it will flourish and prosper, and great will be its peace, for "out of the heart are the issues of life." Having found that selfishness is the root cause of all competition and strife, the question naturally arises as to how this cause shall be dealt with, for it naturally follows that a cause being destroyed, all its effects cease; a cause being propagated, all its effects, however they may be modified from without, must continue. Every man who has thought at all deeply upon the problem of life, and has brooded sympathetically upon the sufferings of mankind, has seen that selfishness is at the root of all sorrow—in fact, this is one of the truths that is first apprehended by the thoughtful mind. And along with that perception there has been born within him a longing to formulate some methods by which that selfishness might be overcome. The first impulse of such a man is to endeavour to frame some outward law, or introduce some new social arrangements or regulations, which shall put a check on the selfishness of others. The second tendency of his mind will be to feel his utter helplessness before the great iron will of selfishness by which he is confronted. Both these attitudes of mind are the result of an incomplete knowledge of what constitutes selfishness. And this partial knowledge dominates him because, although he has overcome the grosser forms of selfishness in himself, and is so far noble, he is yet selfish in other and more remote and subtle directions. This feeling of "helplessness" is the prelude to one of two conditions—the man will either give up in despair, and again sink himself in the selfishness of the world, or he will search and meditate until he finds another way out of the difficulty. And that way he will find. Looking deeper and ever deeper into the things of life; reflecting, brooding, examining, and analysing; grappling with every difficulty and problem with intensity of thought, and developing day by day a profounder love of Truth—by these means his heart will grow and his comprehension expand, and at last he will realize that the way to destroy selfishness is not to try to destroy one form of it in other people, but to destroy it utterly, root and branch, in himself. The perception of this truth constitutes spiritual illumination, and when once it is awakened in the mind, the "straight and narrow way" is revealed, and the Gates of the Kingdom already loom in the distance. Then does a man apply to himself (not to others) these words—And why beholdest thou the mote that is in thy brother's eye, but considerest not the beam that is in thy own eye? Or how wilt thou say to thy brother, let me pull out the mote out of thine eye; and, behold, a beam is in thine own eye? Thou hypocrite, first cast out the beam out of thine own eye; and then shall thou see clearly to cast out the mote out of thine brother's eye. When a man can apply these words to himself and act upon them, judging himself mercilessly, but judging none other, then will he find his way out of the hell of competitive strife, then will he rise above and render of non-effect the laws of competition, and will find the higher Law of Love, subjecting himself to which every evil thing will flee from him, and the joys and blessings which the selfish vainly seek will constantly wait upon him. And not only this, he will, having lifted himself, lift the world. By his example many will see the Way, and will walk it; and the powers of darkness will be weaker for having lived. It will here be asked, "But will not man who has risen above his selfishness, and therefore above the competitive strife, suffer through the selfishness and competition of those around him? Will he not after all the trouble he has taken to purify himself, suffer at the hands of the impure?" No, he will not. The equity of the Divine Order is perfect, and cannot be subverted, so that it is impossible for one who has overcome selfishness to be subject to those laws which are brought into operation by the action of selfishness; in other words, each individual suffers by virtue of his own selfishness. It is true that the selfish all come under the operation of the competitive laws, and suffer collectively, each acting, more or less, as the instrument by which the suffering of others is brought about, which makes it appear, on the surface, as though men suffered for the sins of others rather than their own. But the truth is that in a universe the very basis of which is harmony, and which can only be sustained by the perfect adjustment of all its parts, each unit receives its own measure of adjustment, and suffers by and of itself. Each man comes under the laws of his own being, never under those of another. True, he will suffer like another, and even through the instrumentality of another, if he elects to live under the same conditions as that other. But if he chooses to desert those conditions and to live under another and higher set of conditions of which that other is ignorant, he will cease to come under, or be affected by, the lower laws. Let us now go back to the symbol of the tree and carry the analogy a little further. Just as the leaves and branches are sustained by the roots, so the roots derive their nourishment from the soil, groping blindly in the darkness for the sustenance which the tree demands. In like manner, selfishness, the root of the tree of evil and of suffering, derives its nourishment from the dark soil of ignorance. In this it thrives; upon this it stands and flourishes. By ignorance I mean something vastly different from lack of learning; and the sense in which I use it will be made plain as I proceed. Selfishness always gropes in the dark. It has no knowledge; by its very nature it is cut off from the source of enlightenment; it is a blind impulse, knowing nothing, obeying no law, for it knows none, and is thereby forcibly bound to those competitive laws by virtue of which suffering is inflicted in order that harmony may be maintained. We live in a world, a universe, abounding with all good things. So great is the abundance of spiritual, mental and material blessings that every man and woman on this globe could not only be provided with every necessary good, but could live in the midst of abounding plenty, and yet have much to spare. Yet, in spite of this, what a spectacle of ignorance do we behold! We see on the one hand millions of men and women chained to a ceaseless slavery, interminably toiling in order to obtain a poor and scanty meal and a garment to cover their nakedness; and on the other hand we see thousands, who already have more than they require and can well manage, depriving themselves of all the blessings of a true life and of the vast opportunities which their possessions place within their reach, in order to accumulate more of those material things for which they have no legitimate use. Surely men and women have no more wisdom than the beasts which fight over the possession of that which is more than they can all well dispose of, and which they could all enjoy in peace! The rich and the poor alike suffer for their own selfishness; and none escapes. The rich have their particular sufferings as well as the poor. Moreover, the rich are continually losing their riches; the poor are continually acquiring them. The poor man of today is the rich man of tomorrow, and vice versa. There is no stability, no security in hell, and only brief and occasional periods of respite from suffering in some form or other. Fear, also, follows men like a great shadow, for the man who obtains and holds by selfish force will always be haunted by a feeling of insecurity, and will continually fear its loss; while the poor man, who is selfishly seeking or coveting material riches, will be harassed by the fear of destitution. And one and all who live in this underworld of strife are overshadowed by one great fear—the fear of death.